Updated Friday September 21, 2018 by Orange Crush. TO REGISTER: CLICK ON THE GREY BOX - "REGISTRATION NOW OPEN - Click Here to Register" located on the HOME PAGE. The Fall Academy will be used for our TRYOUTS for the 2018 Fall Travel & 2019 Summer Travel Teams for GIRLS Grades 3rd - 11th. During the registration process you will be asked if you would like to be EVALUATED for our TRAVEL TEAMS. 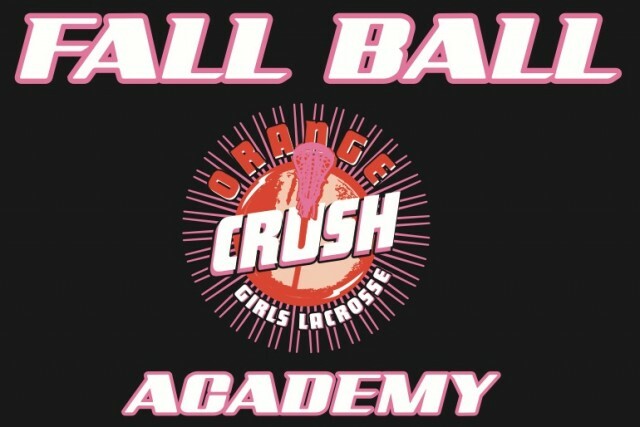 RETURNING Academy players will receive an Orange Crush Long Sleeve T-shirt and NEW players will receive an Orange Crush pinney. Additional t-shirts & pinnies can be purchased on our online store during the reigistration process. ACADEMY HIGHLIGHTS: Five (5) practice sessions with 90 minutes of intense lacrosse skills, drills and games. Elite level development of stick skills, dodging, shooting, positioning and teamwork concepts. GIRLS 10th, 11th (3) Practice Sessions/Try-Out.